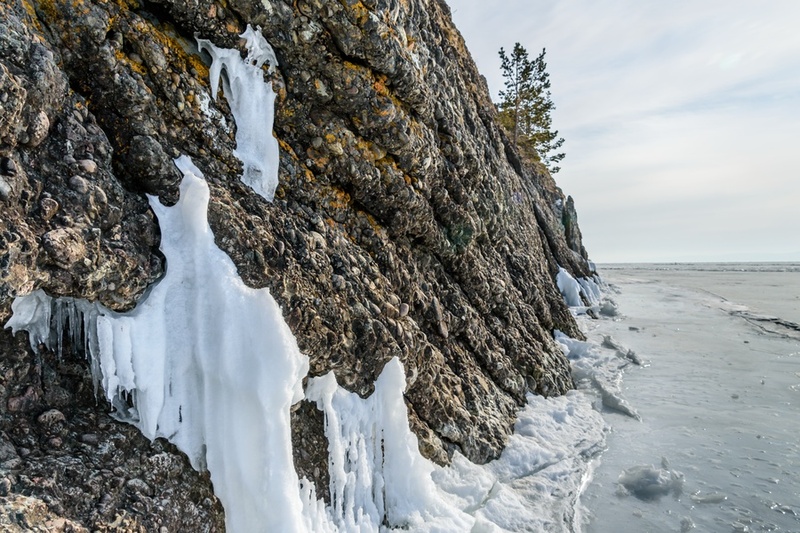 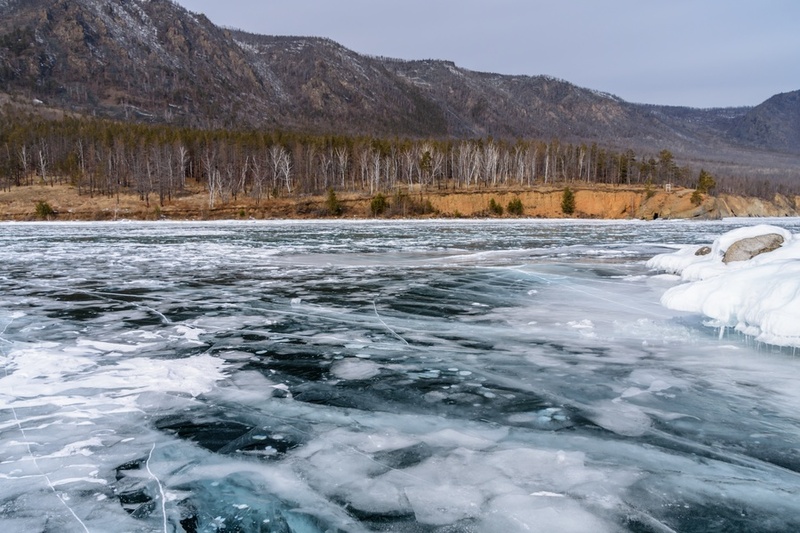 The south-western coast of Lake Baikal offers fantastic opportunities to observe various types of ice, among superb landscapes, remote villages and petroglyphs left by primitive populations. 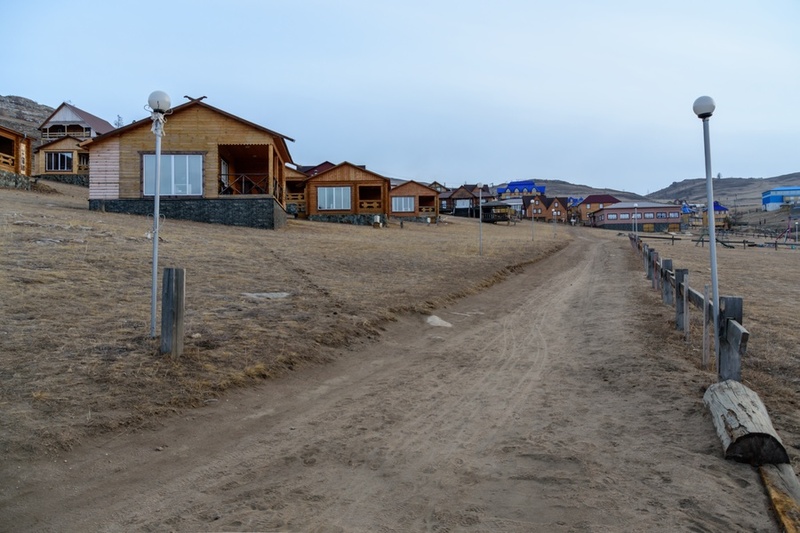 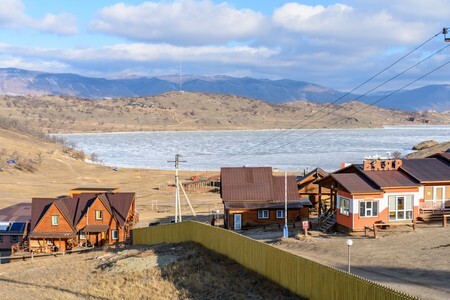 The main gateway to southern Baikal Lake is the village of Listvjanka, where we arrived the evening before and where we stayed overnight. 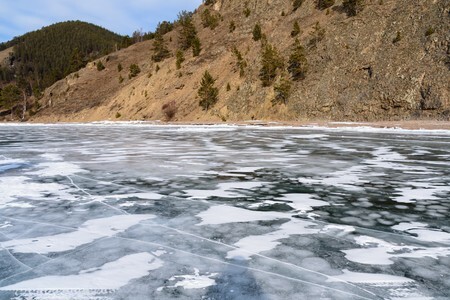 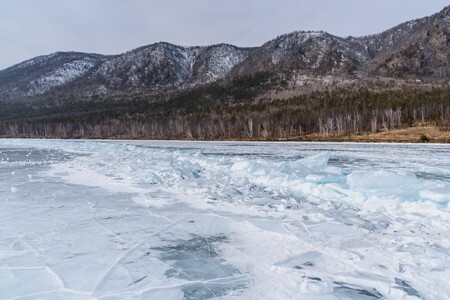 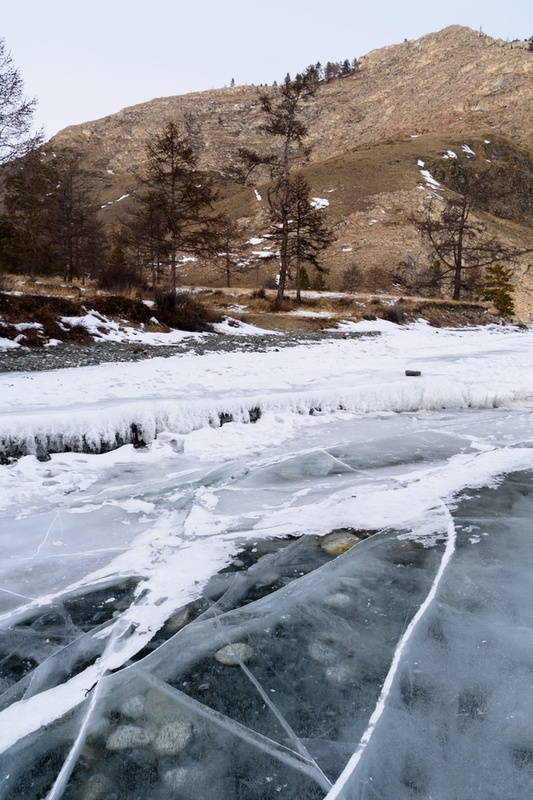 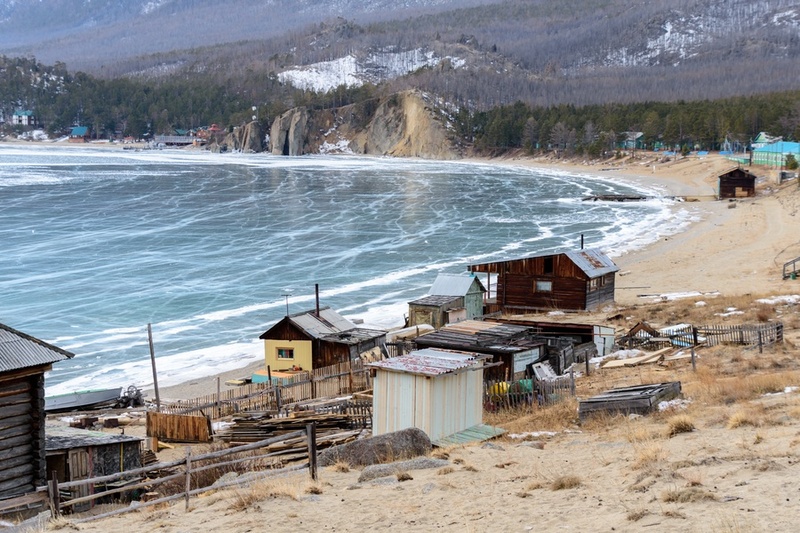 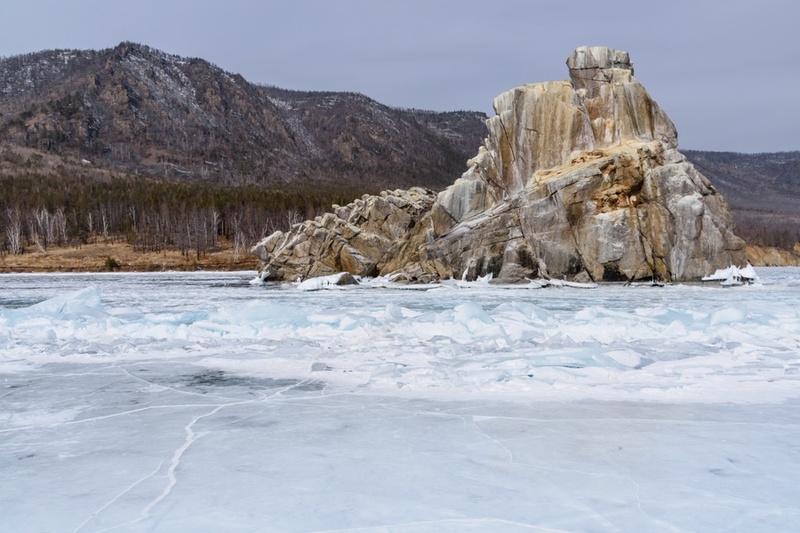 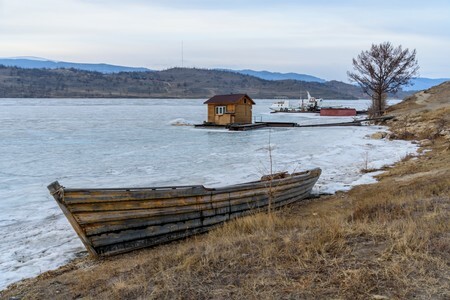 From Listvjanca it is possible to explore the south-western coast of Lake Baikal going north by various vehicles, depending on the season and the conditions of the ice. 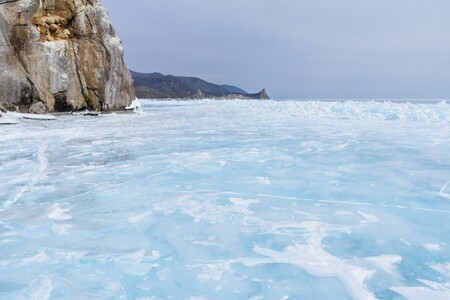 During the second half of winter, the journey can be made entirely on the Baikal ice, using either an hovercraft or a normal car equipped with suitable tires. 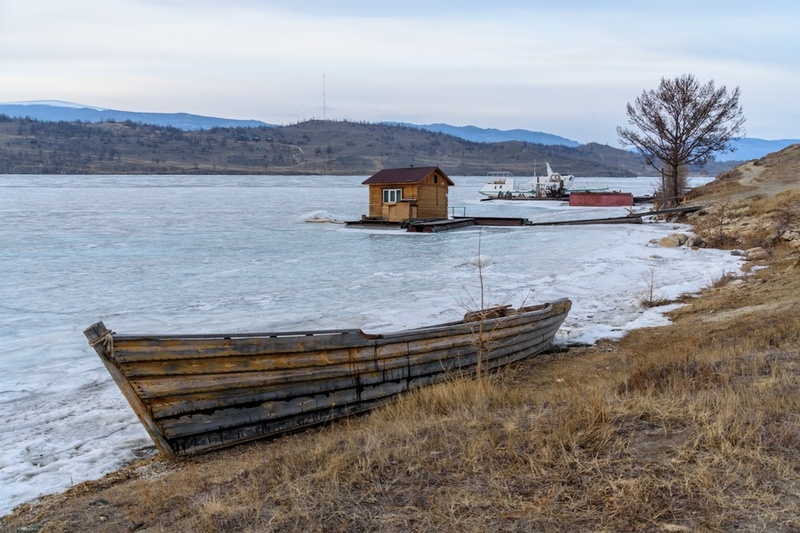 When the ice thaws, visitors may proceed aboard boats with reinforced hull, while in summer small cruise ships or motorboats are perfectly suitable. 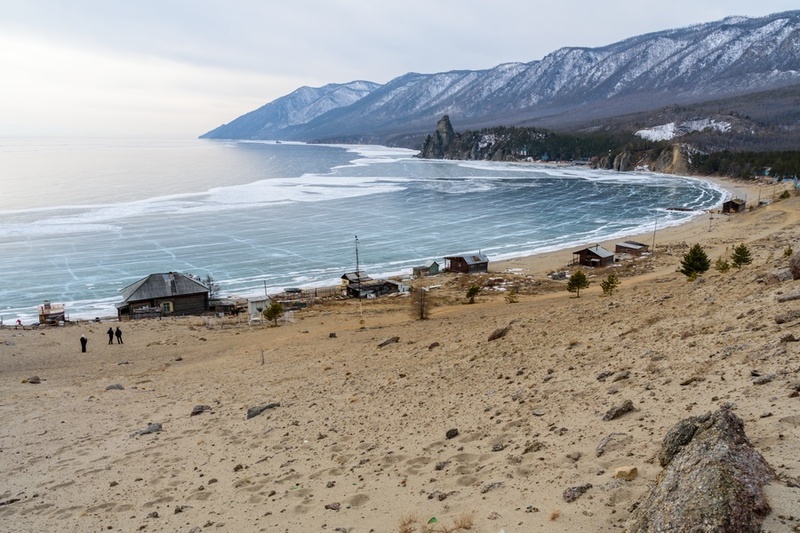 During this interesting day of Lake Baikal crossing, we will travel for about 200 kilometers from Listvyanka to the remote village of Mrs, a tiny outpost with few houses, reachable only through the natural highway of Lake Baikal. 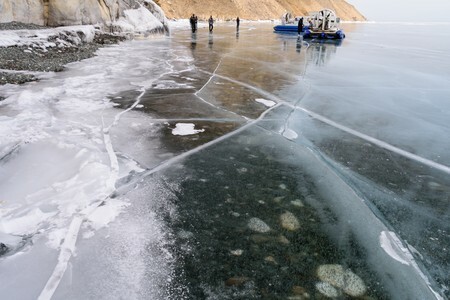 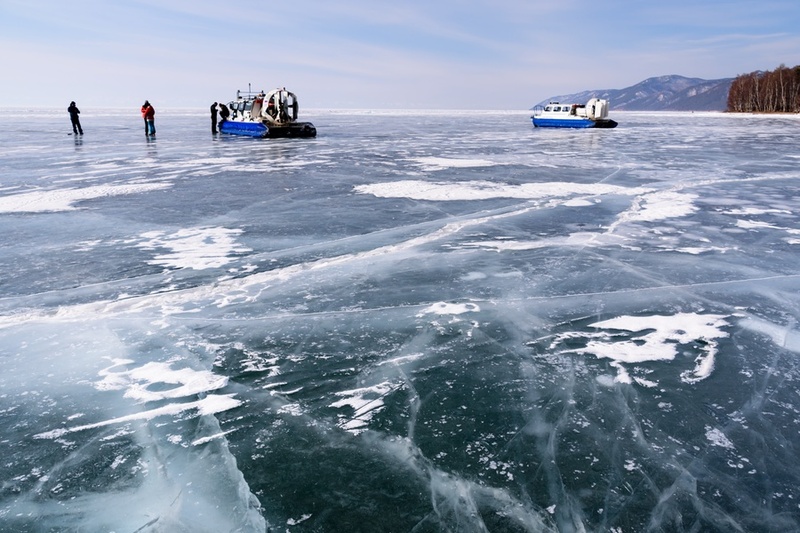 The crossing of Baikal ice is carried out by hovercraft, stopping at an infinite number of spectacular places to observe various types of ice: transparent ice, black ice, blue ice and ice crystals (or ice flowers) that fly away by simply blowing on them. 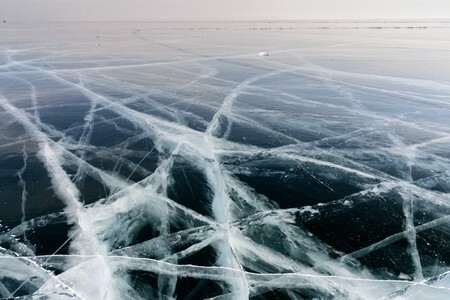 We will observe also lot of methane bubbles trapped in the ice. Along a cliff we will observe also petroglyphs left by some ancient population, dated over 2500 years ago. 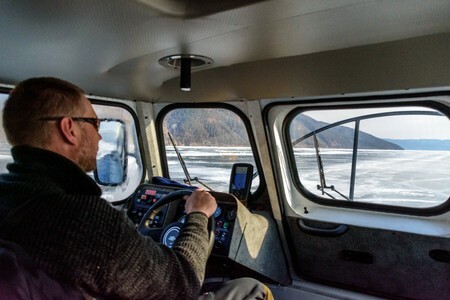 The hovercraft is the ideal vehicle to safely move on the ice of Lake Baikal, as it can easily deal with a wide variety of surfaces, like clear ice, snow and water. The vehicle travels at around 50 kilometers per hour, it is supported by an air cushion and pushed by a large rear propeller. 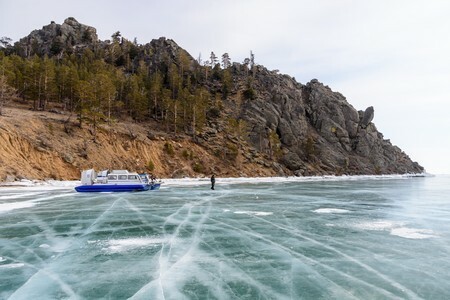 During the crossing of Lake Baikal, the hovercraft makes numerous stops where the ice is more spectacular, to let passengers make exciting walks to discover this surreal landscape, which can be certainly listed among the greatest wonders of the world. 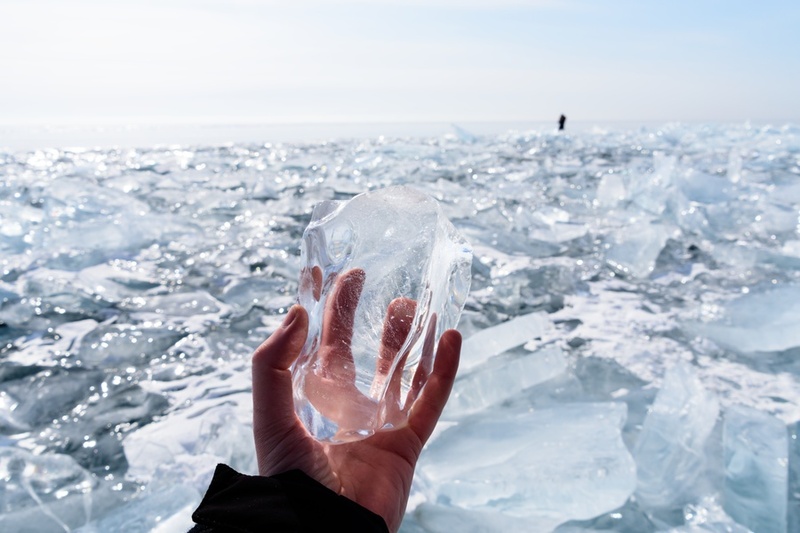 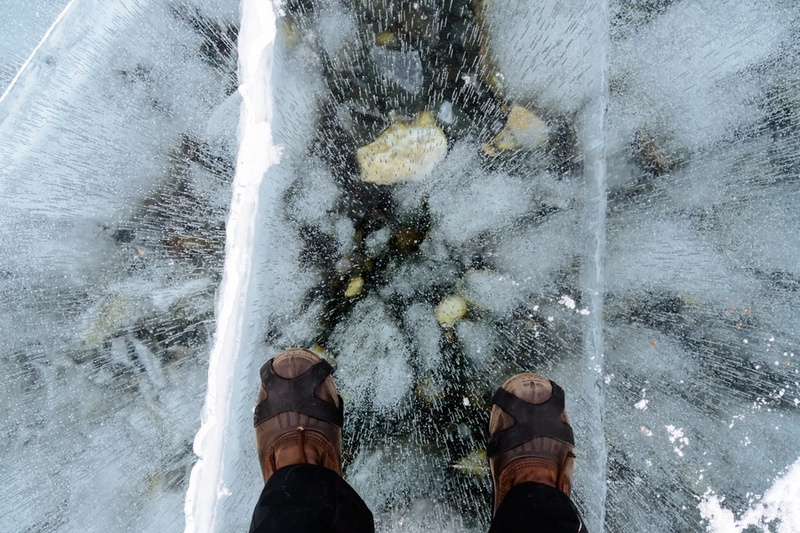 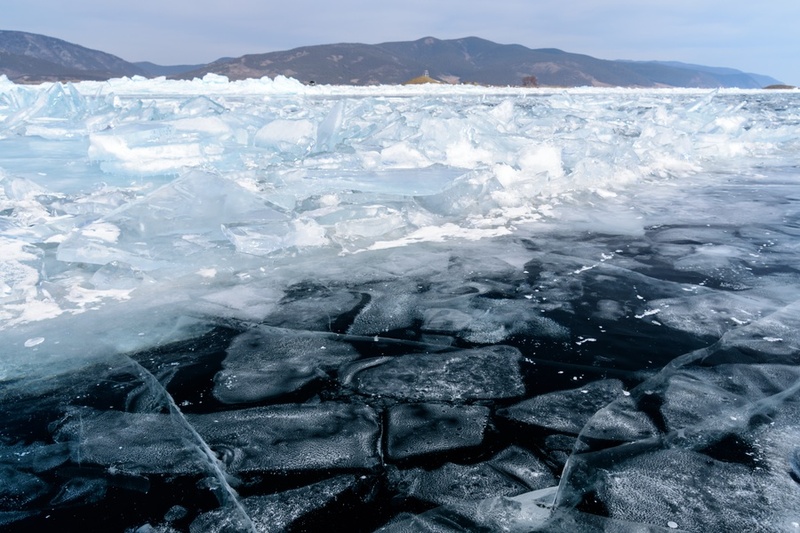 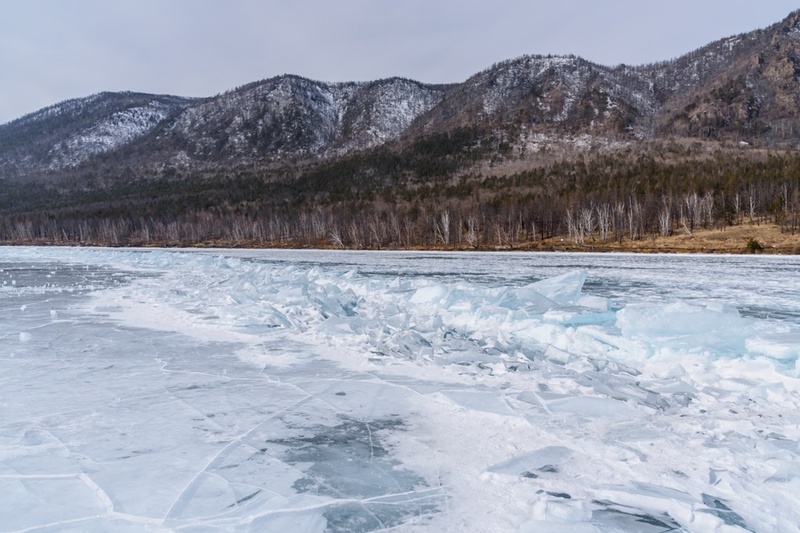 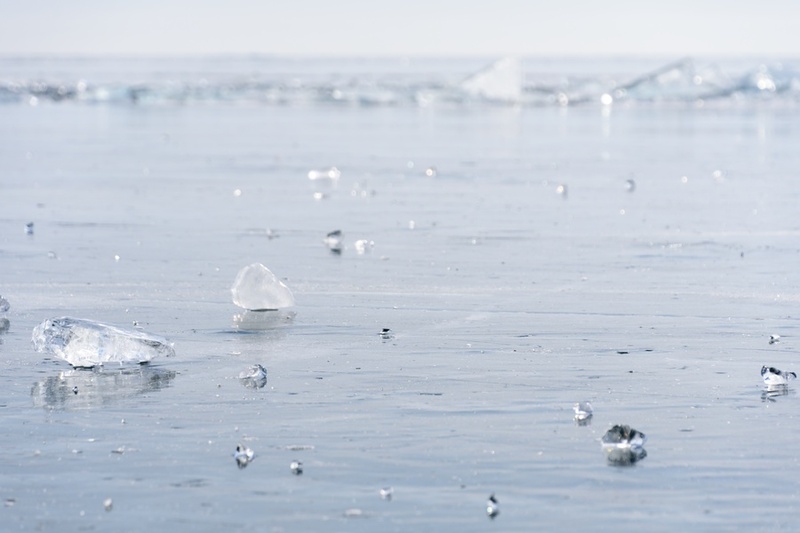 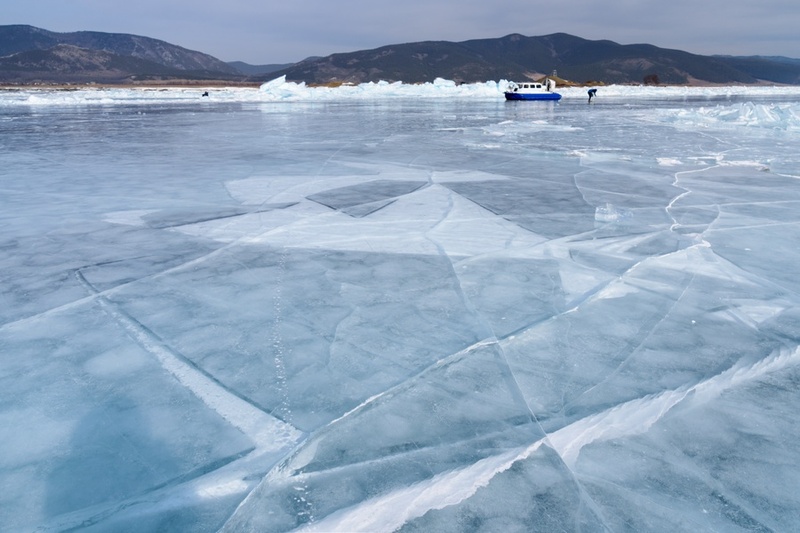 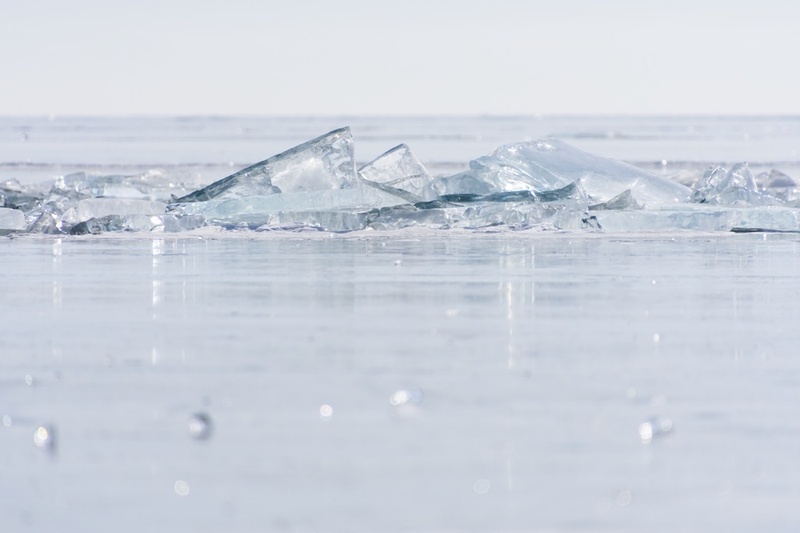 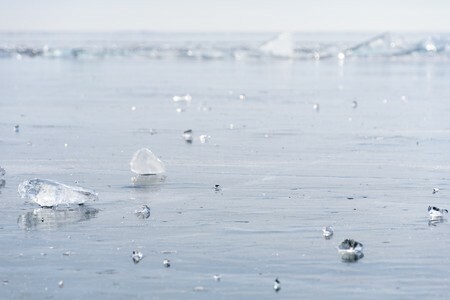 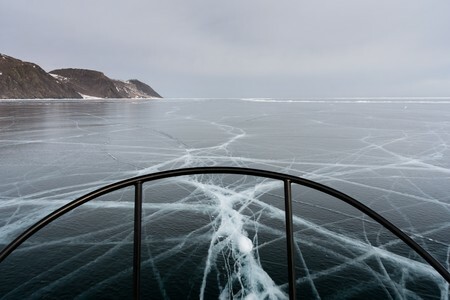 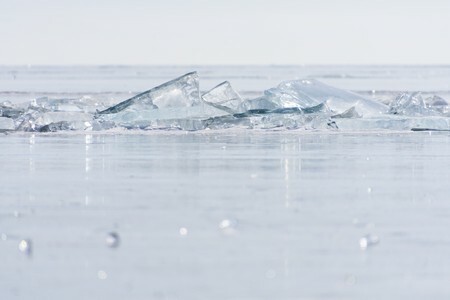 On Lake Baikal it is possible to observe a wide range of types of ice, from "black" to transparent, as we will see several times during this expedition. 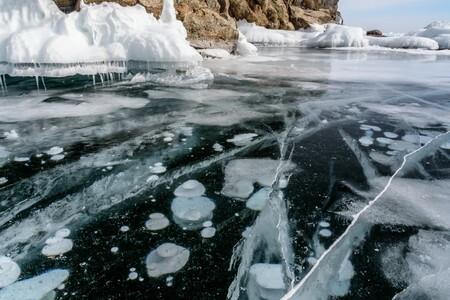 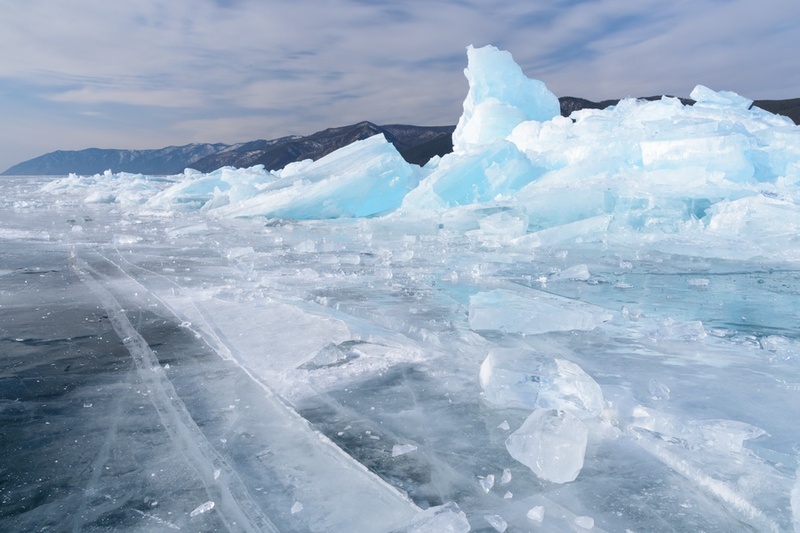 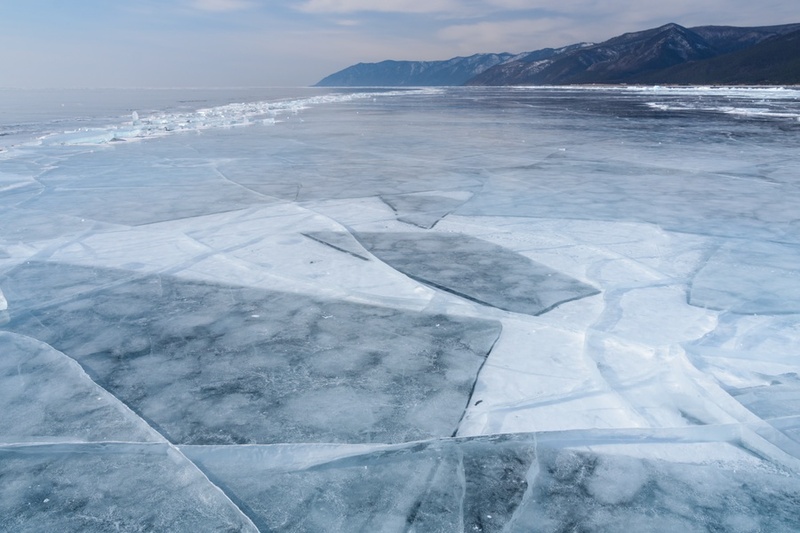 One of the most striking features of Lake Baikal ice are the methane bubbles trapped in the ice itself. The smaller and denser ones are produced by some algae that live on the bottom from the Baikal. 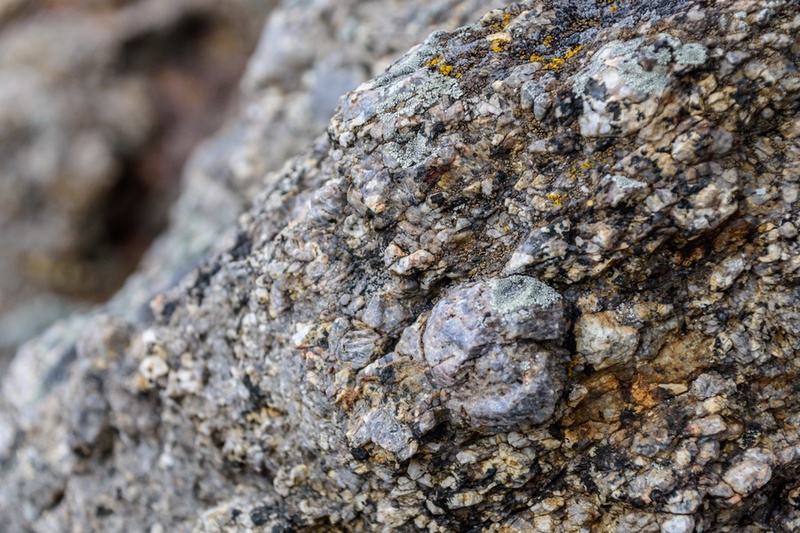 Instead, walking along the coast, on very hard and safe ice, visitors may see beautiful conglomerate rocks (larger pebbles and stones glued together by sand) covered with orange lichens. 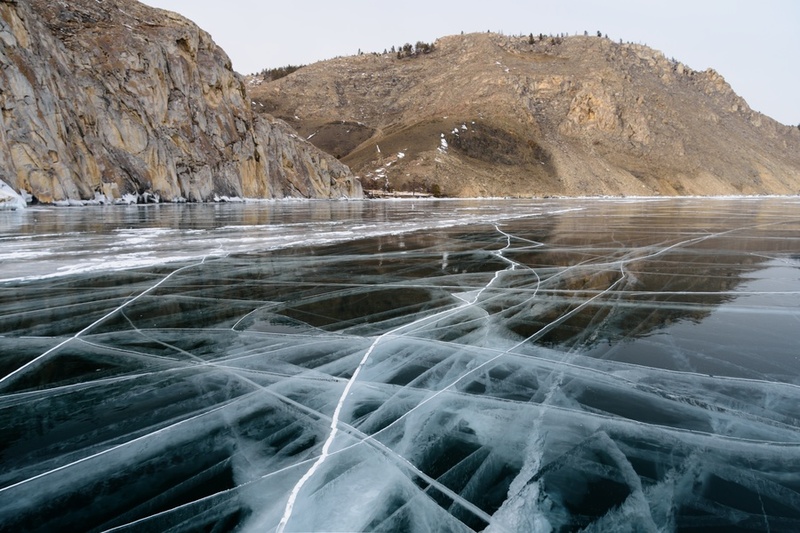 During the second half of winter, Lake Baikal becomes an immense crystal world, with ice completely exposed by the absence of snow. The lack of snow is due to several factors, including scarce precipitations (this is actually a sub-arctic desert) and wind. 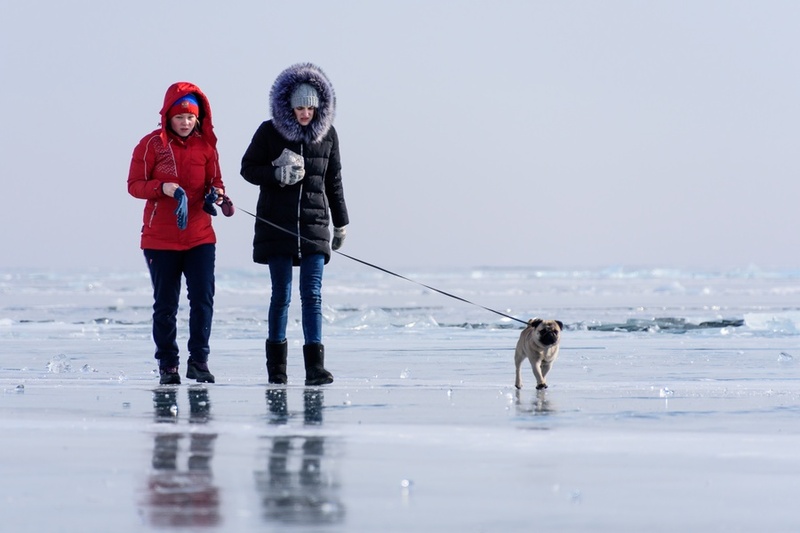 The pug dog of the ice. 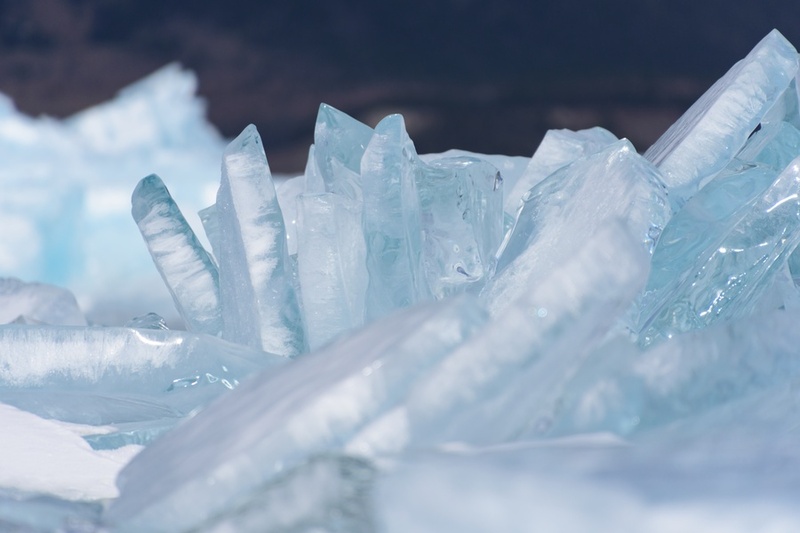 Where the ice breaks to compensate the enormous pressure, there is a messy and chaotic mass of blocks of ice and transparent ice sheets, like if it was created by a bulldozer gone mad. 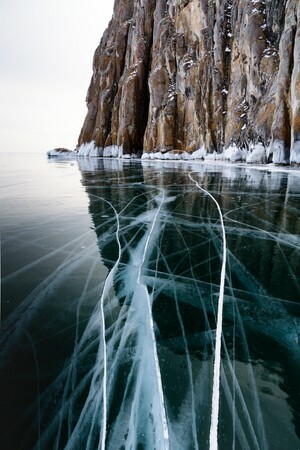 The various cracks (but also the smallest veins) allow the oxygen to reach the waters below. 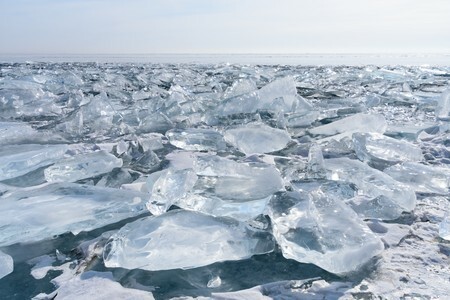 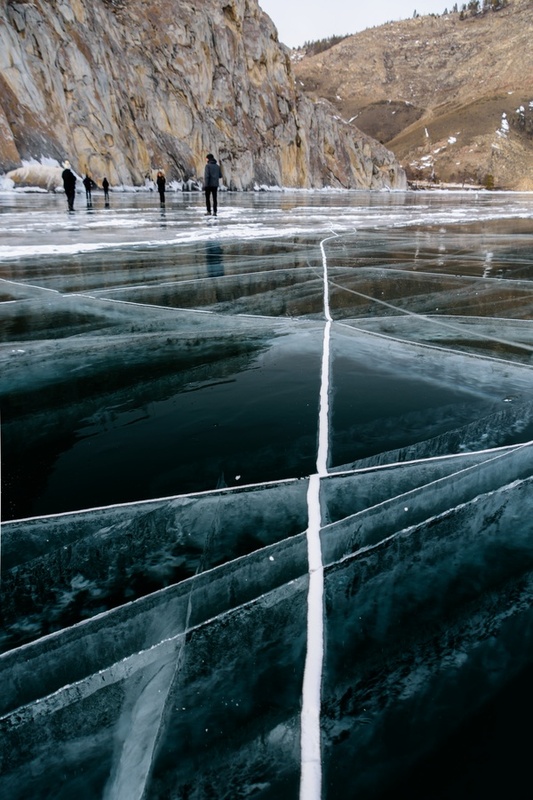 Lake Baikal's transparent ice. 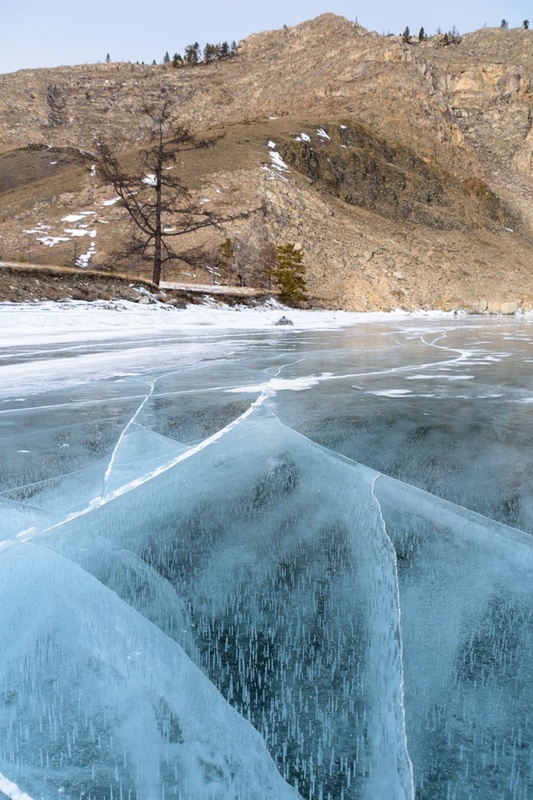 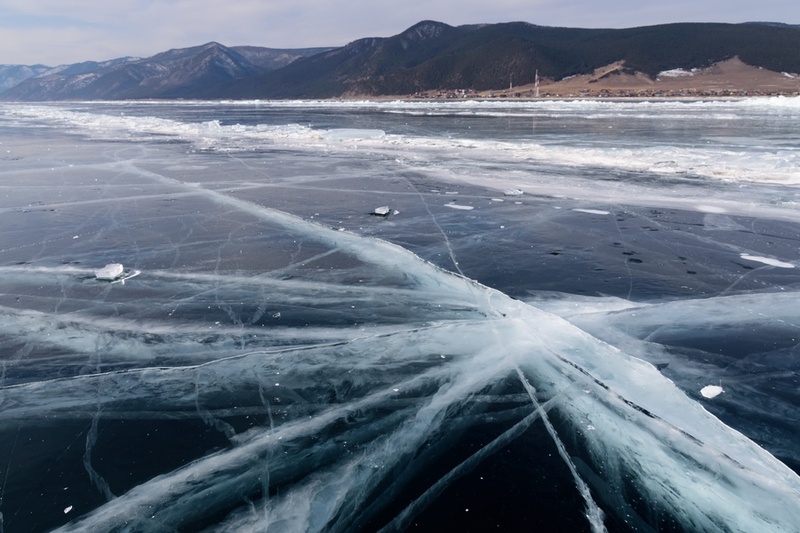 Why the Baikal lake's ice is so transparent? 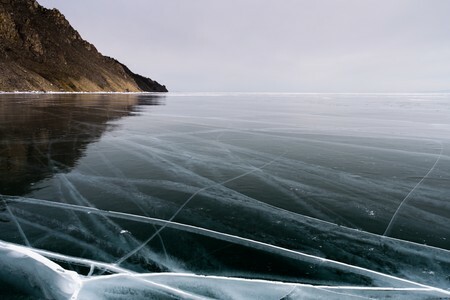 Containing over 20% of the fresh water available on Earth (excluding the polar ice caps), Lake Baikal is also the largest freshwater basin on the planet and the one with the clearest waters. 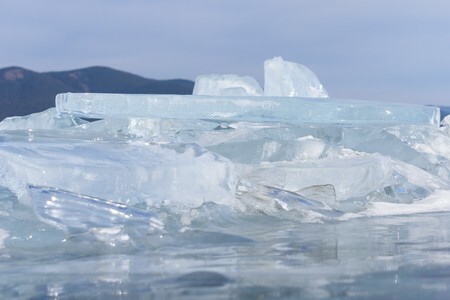 Such clarity, which is obviously observable both in the actual water, as well as in the ice, is due to a number of factors. 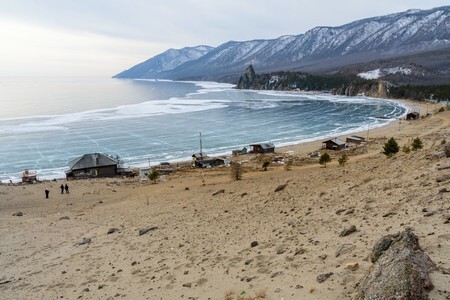 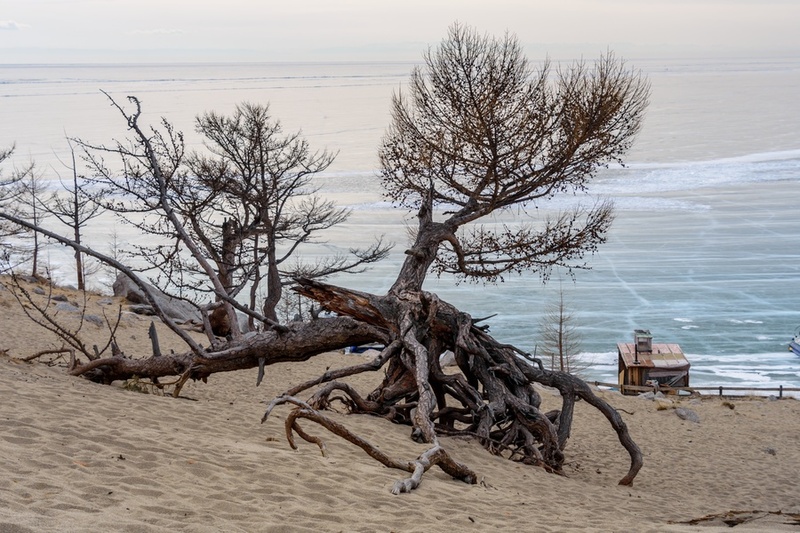 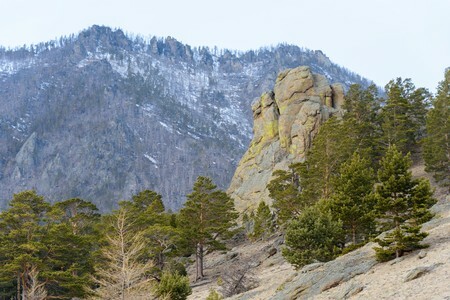 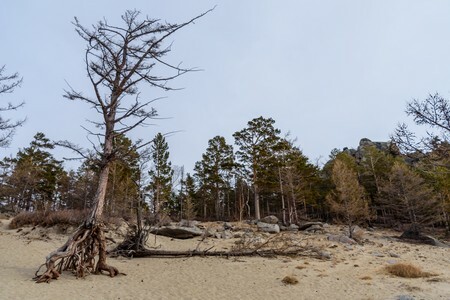 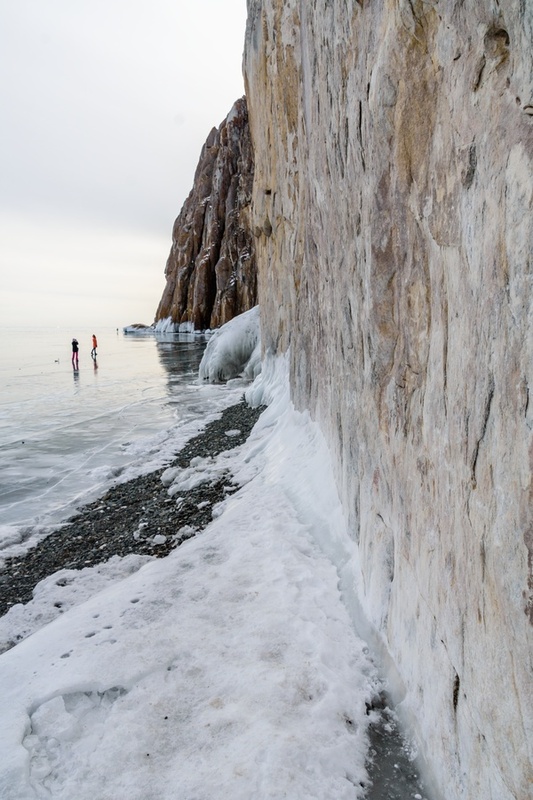 First of all, the cliffs are usually very steep and rocky, while the beaches are relatively few: this means that the waters of Baikal Lake have only minimal contamination with sand or limestone. 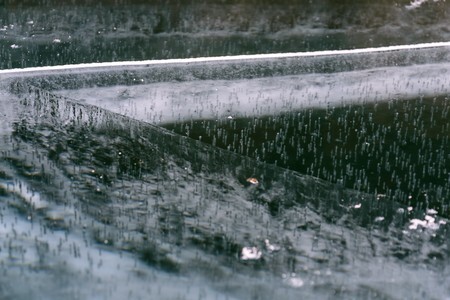 Furthermore, biochemical processes play a fundamental role, as some micro-organisms and algae metabolize many of the impurities, causing them to fall to the bottom of the lake, working like a real water treatment and purification plant. The transparency of the ice is also given by the rapid freezing of the water that occurs in early winter, without significant phases of freezing and thawing, and therefore without incorporating any layers of snow or frost inside the ice sheets. 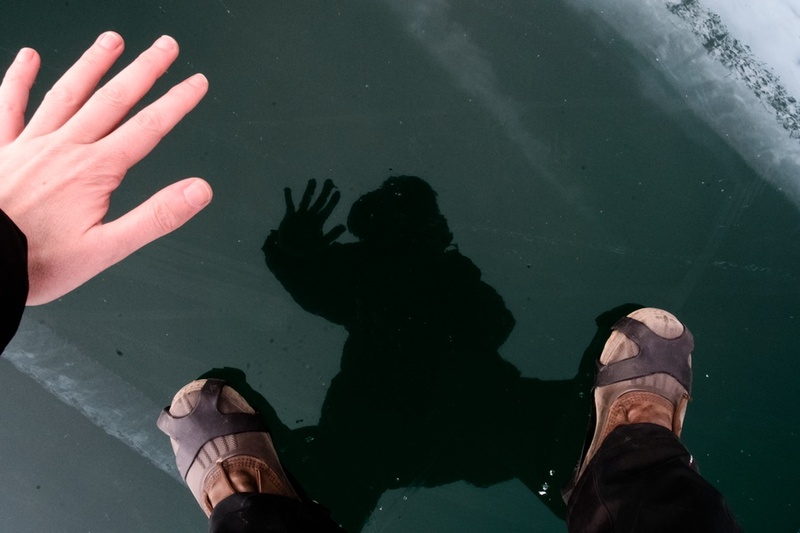 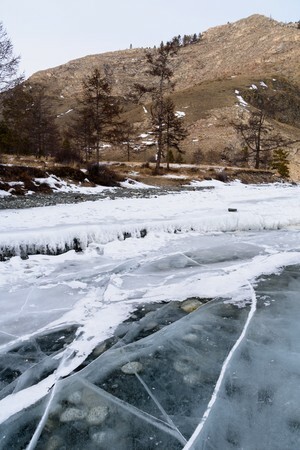 Another type of ice from Lake Baikal is the so called "black ice". 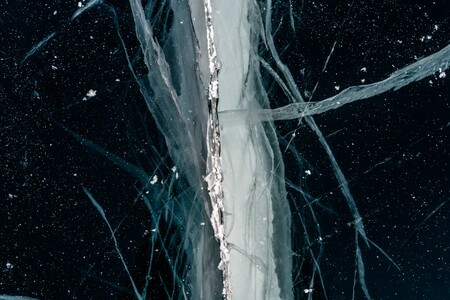 Actually, the ice is far to be really black, but it appears black just because it is so transparent, that it lets to see down into the abyss, where there is no light and no reflected light. Lake Baikal is the deepest lake in the world with a maximum depth of 1642 meters, while the steep cliffs along the coast just sink down very quickly. 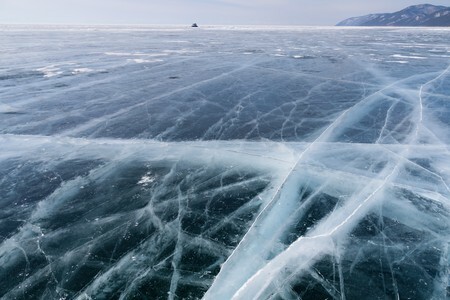 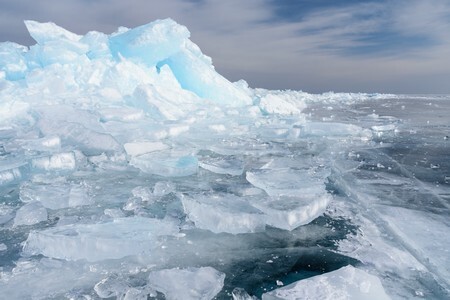 The numerous veins in the ice guarantee the oxygenation of the water below, while the thickness of the ice, from 50 to 140 centimeters, makes possible to support a load of 15 tons (prudently considering the minimum thickness of 50 centimeters). Actually, on the frozen Baikal lake, could safely land a fully loaded 50 seater plane. 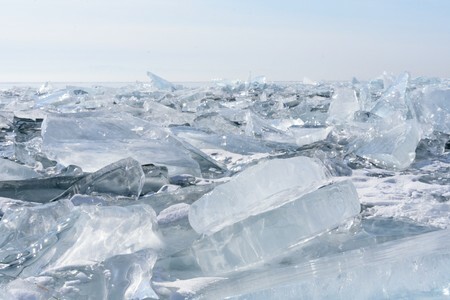 In this area, instead, a perfectly transparent ice floor rests on top of a messy puzzle of ice blocks of the most traditional white. 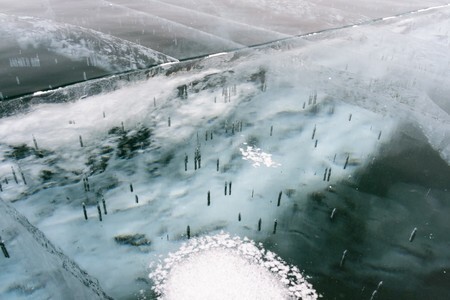 Blocks of less pure ice trapped and cemented together by perfectly transparent ice that appears black. 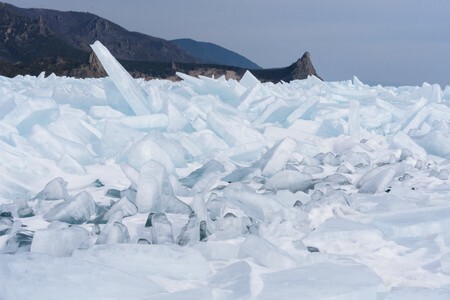 Blue ice is less common and appears mainly along fracture zones. 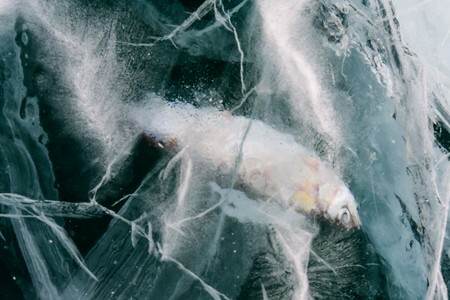 In the first image, an omul fish trapped in a block of ice. 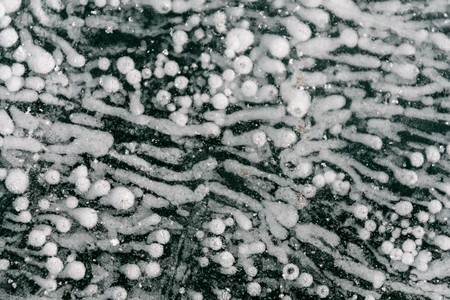 In the second photo instead, beautiful methane bubbles frozen in the ice. If necessary, it is possible to make a hole with a manual drill, insert a straw and light a fire. 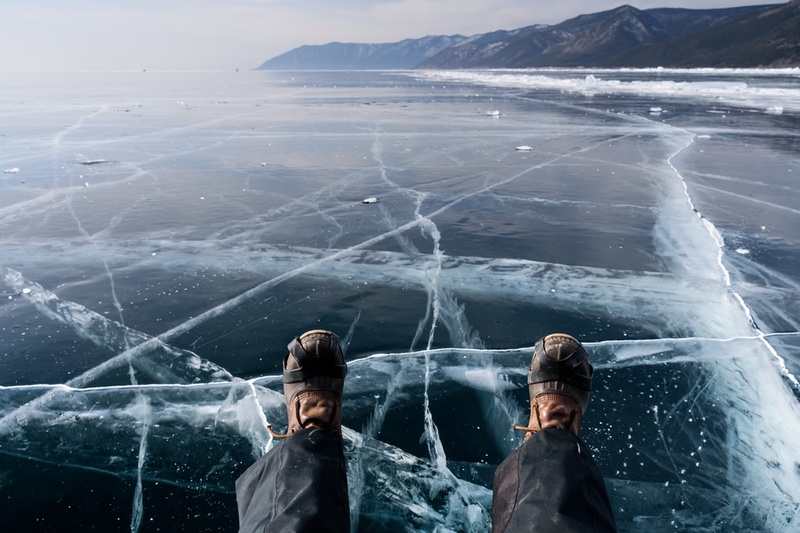 A stop along a bay allows to observe the Baikal lake from top, with the immense ice sheet without any snow on top, extending beyond the horizon. 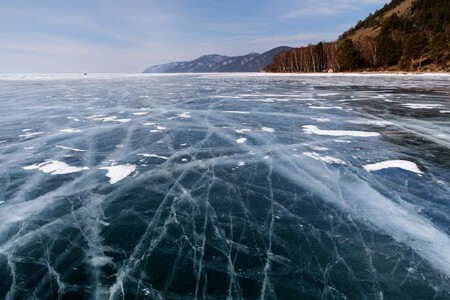 Lake Baikal is 636 kilometers long and 80 kilometers wide at its maximum point. 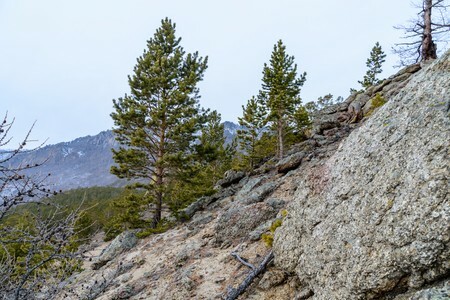 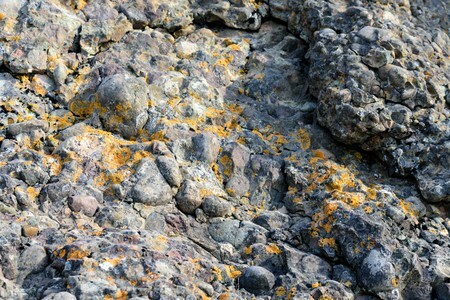 The vegetation of Siberia, among beautiful rocks covered with colored lichens. 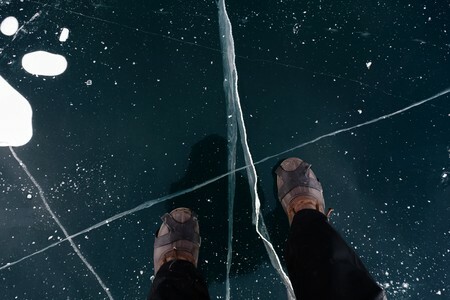 On the hovercraft again, highly surreal landscapes follow one after another, with wide expanses of black ice marked by endless veins. 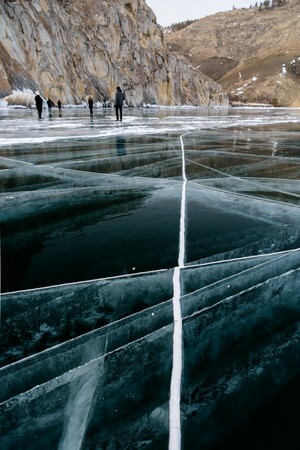 The black ice near a steep cliff where the bottom of the lake is already very deep. 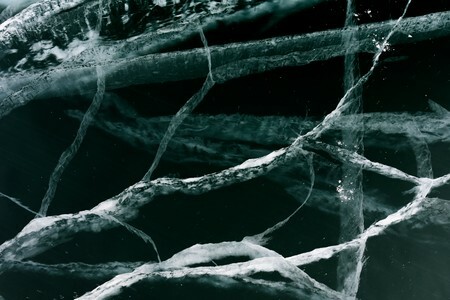 Transparent and perfectly smooth ice, by touching it just seems to pass the hand over a sturdy armored glass. 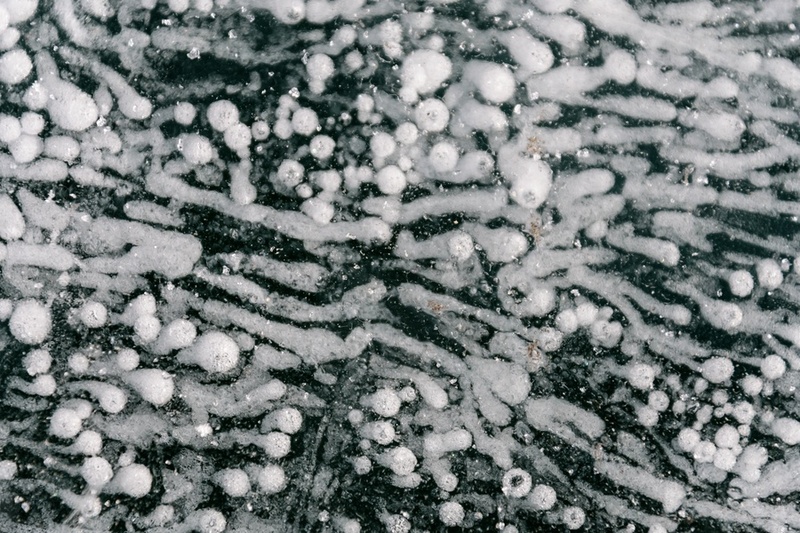 Lot of gas bubbles trapped in the ice. 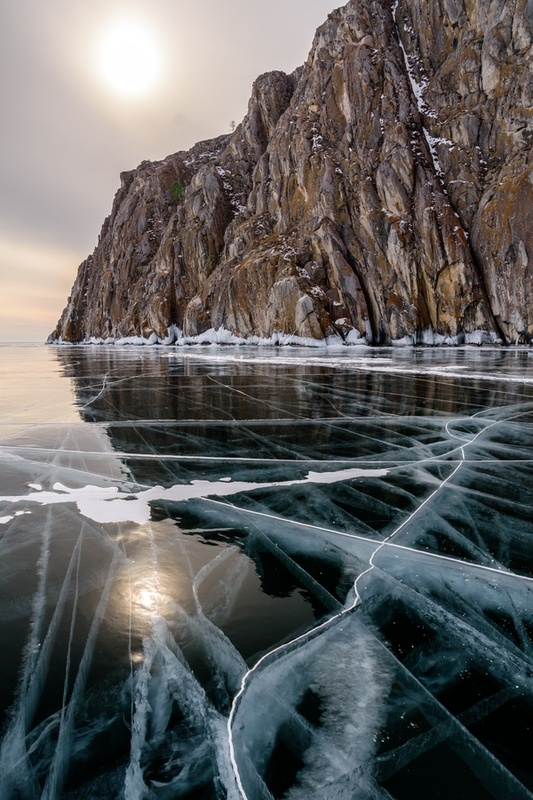 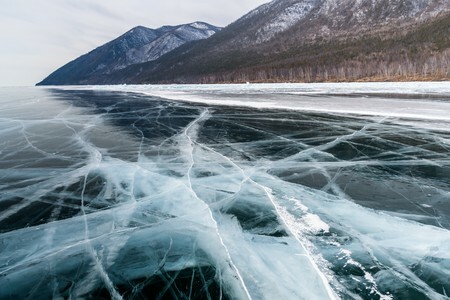 The fantastic black ice of Baikal, with the chaotic veins that form chaotic patterns. 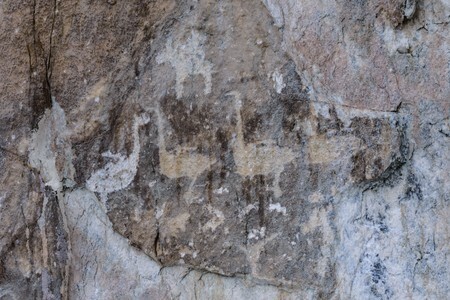 The cliff has in fact numerous petroglyphs showing human and animal figures (in this case, some geese). 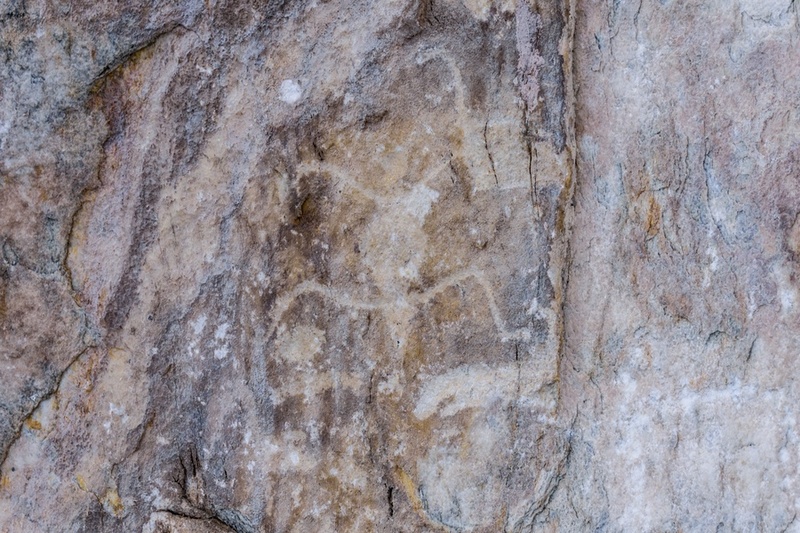 It is estimated that these petroglyphs date back to around 2500 years ago. 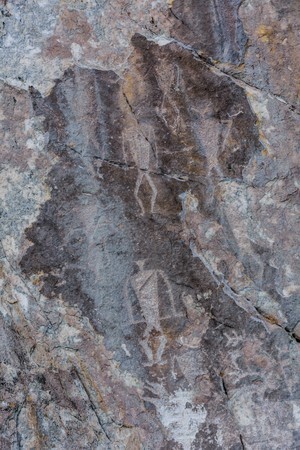 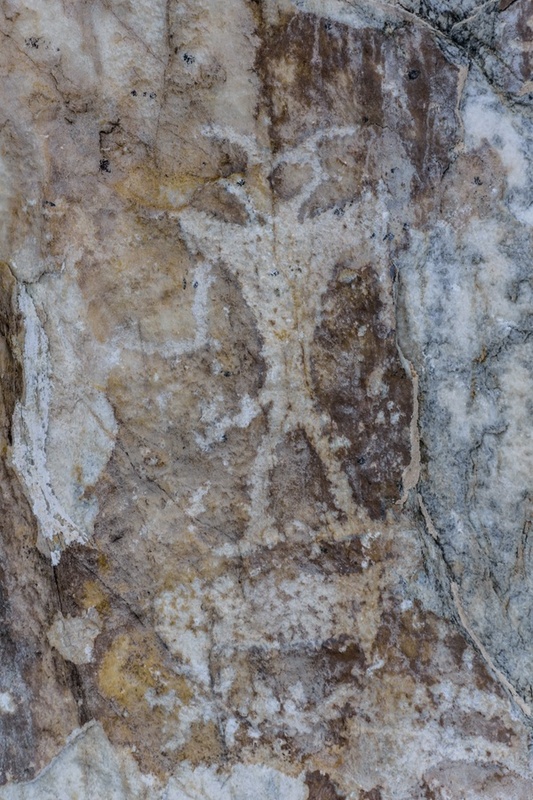 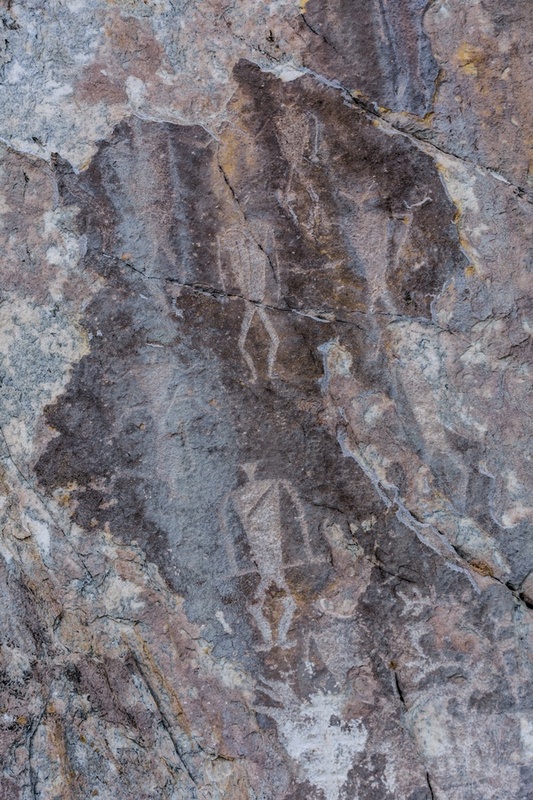 More petroglyphs with human figures along a cliff in Lake Baikal. 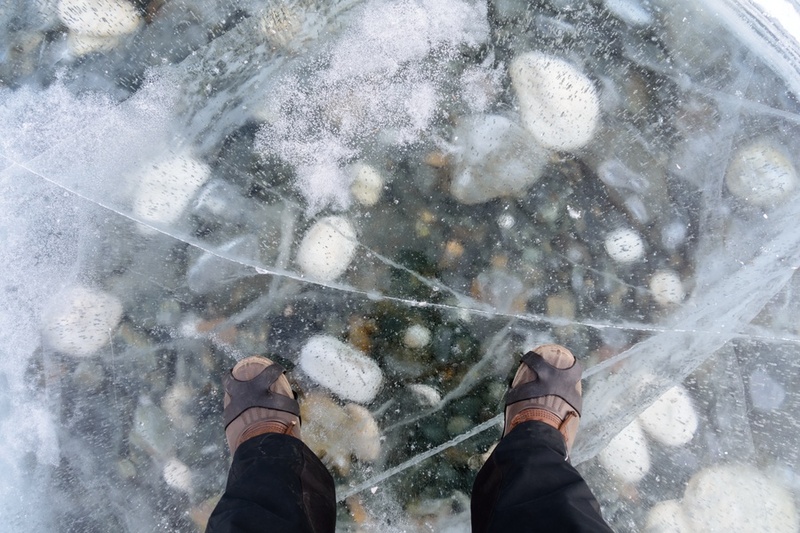 Walking on transparent ice that reveals the bottom of the lake, with pebbles and larger stones. 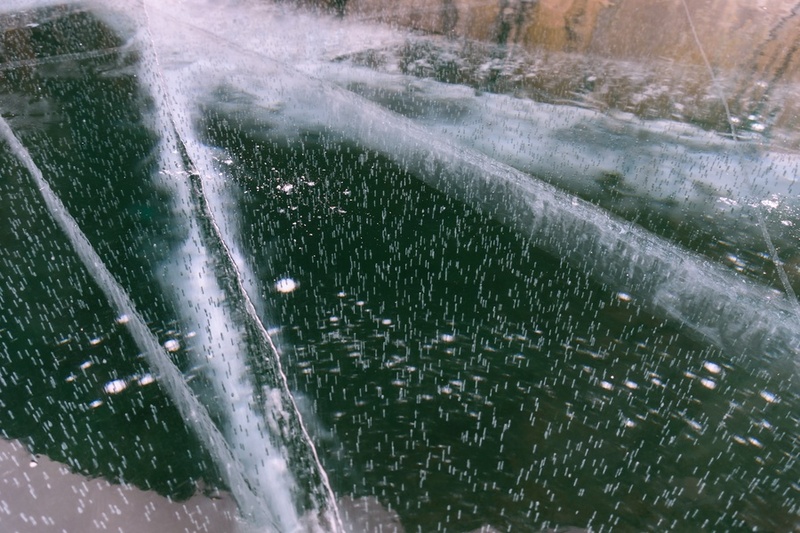 Despite the transparency, the ice is very thick and could hold a truck. 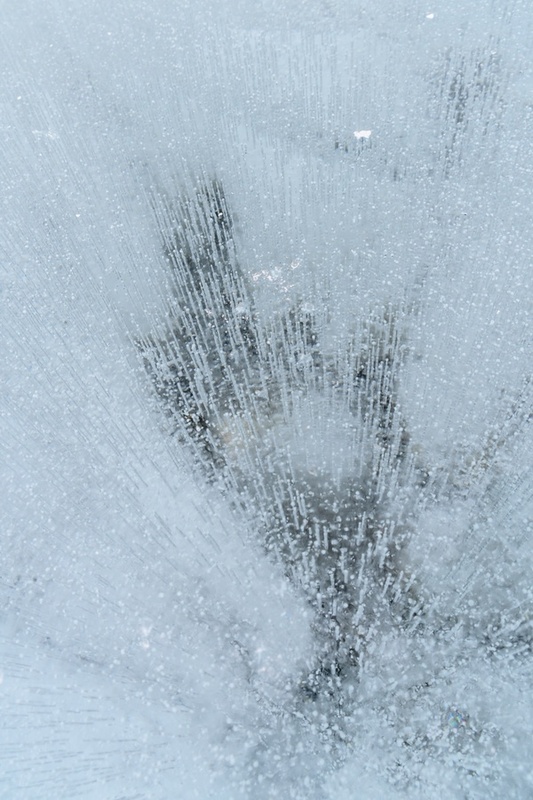 "The explosion" of bubbles of gas trapped in the ice, creating a curious optical effect when observed from top. 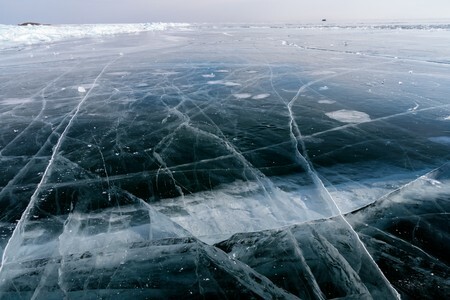 A few more glances on the transparent ice and on a beautiful blue ice full of gas bubbles. Veins and bubbles in transparent ice. 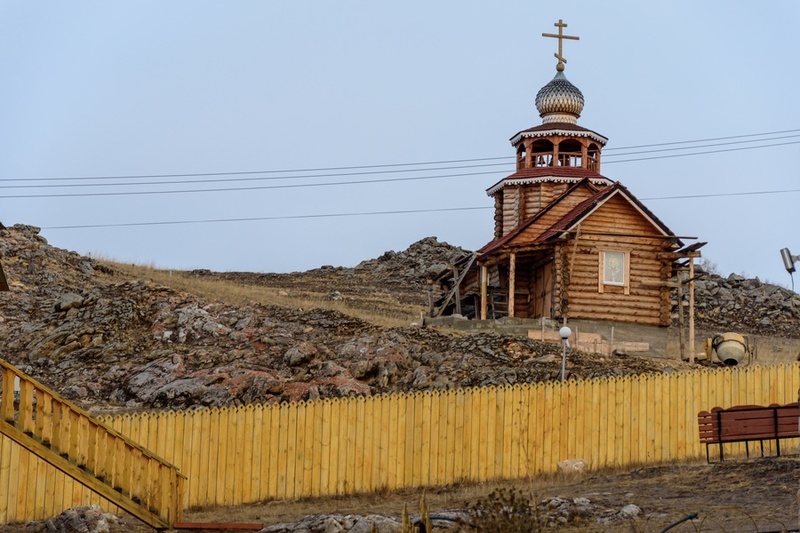 The small village of Mrs is located along the western shore of Lake Baikal, opposite Olkhon island, and is a good logistics base for other excursions in the area or for an overnight during longer journeys on Baikal lake. Where to stay in Mrs? 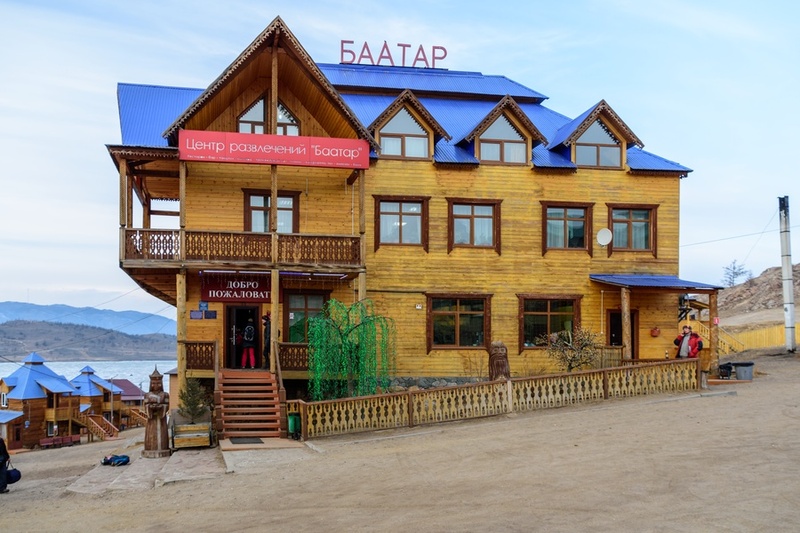 In the village there are a couple of small hotels and a few cozy inns with services that you wouldn't expect in such remote areas. 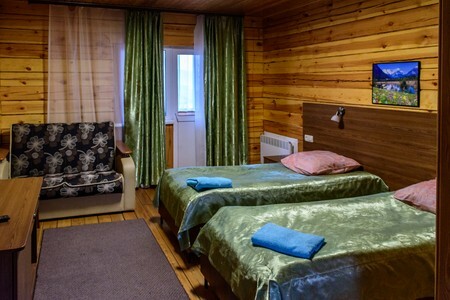 Due to increasing tourism it is expected that the facilities will grow and improve furthermore.